Carl Frampton secured a sensational second-round knock-out win over Hugo Cazares in the WBC super-bantamweight title eliminator in Belfast. 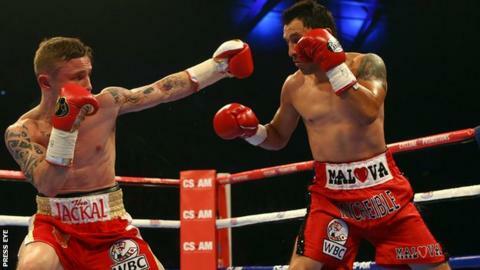 Frampton's devastating left-hook floored the 36-year-old Mexican who appeared to mistime the 10-count before getting up. It was the first time Cazares had been stopped since losing to compatriot Gerson Guerrero in October 1999. Frampton, 27, will now be in line for a crack at WBC champion Leo Santa Cruz. "We are going to make an outstanding proposal to Santa Cruz financially and hopefully he will come over to Belfast," said Frampton's manager Barry McGuigan. "The sooner we can get it on the better. "He has got morals and I believe he genuinely wants to fight Carl. It is all about sitting down and hammering out the deal." Frampton, who has now won all 18 professional fights, including 13 inside the distance, said: "That was a big shot that hurt him and it shows the power I have. "I just threw it and it landed and that was game over. "The support has been fantastic. I have the loudest bunch of supporters in Europe without doubt." On a future fight with Santa Cruz, Frampton added: "He wants to be in blockbuster fights and me against him would be huge. "It is the most exciting fight out there right now and I think he will want it even more now."